The Janome Schoolmate S-3023 sewing machine was designed for classroom use, but is the perfect machine for all sewing enthusiasts - whatever the venue! 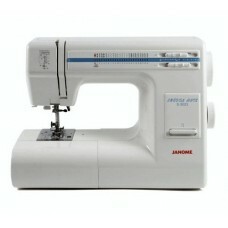 The Janome S3023 features 24 built-in stitches, including 1 one-step buttonhole for a wealth of options. A threading chart is printed on the front of the Janome S-3023 sewing machine to help beginners, and a finger guard is fixed on the machine. It is UL approved, and includes a hard cover for storage.